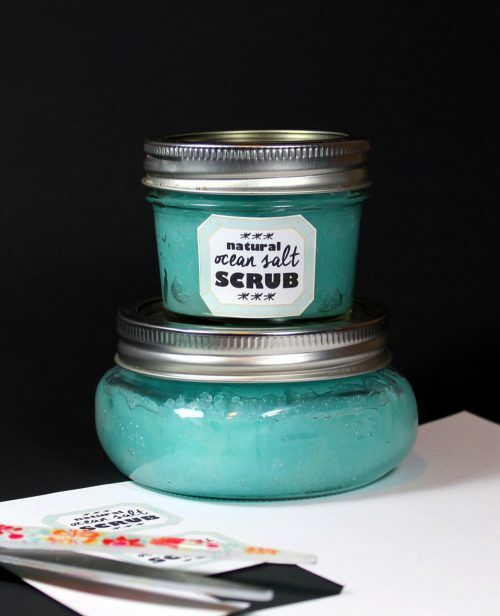 This sea salt face and body scrub recipe is loosely inspired by Lush’s Ocean Salt Face and Body Scrub. 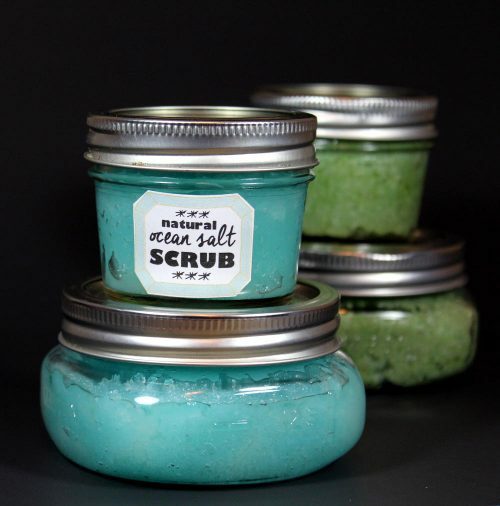 Made using fine dead sea salt, this emulsified sea salt face and body scrub recipe has a creamy texture and is gentle enough for even sensitive skin. Ingredients like mango butter, fractionated coconut oil and lanolin help to condition and protect skin while dead sea helps to promote healing. Want to make it vegan? Try substituting the lanolin – which is found in Lush’s Ocean Salt Face and Body Scrub – with cupuacu butter. I left my sea salt face and body scrub recipe unscented. The final product doesn’t really have any kind of scent to it, however, so you can easily scent your face and body scrub if desired. To scent your product I recommend using .05 oz. – .1 oz. of fragrance oil or half that amount if using essential oils. As a bonus I’ve included free printable labels for your finished face and body scrubs. 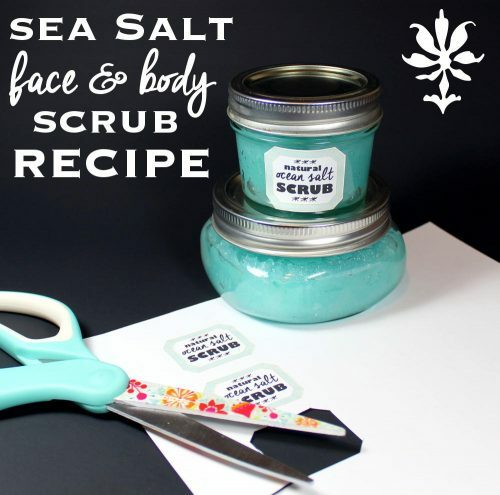 You can find the PDF printable labels following the sea salt face and body scrub recipe below. Lush’s Ocean Salt Face and Body Scrub contains virgin coconut oil. I decided instead to use fractionated coconut oil for my sea salt face and body scrub recipe. Fractionated coconut oil is generally better for use in skin care products as it’s less comedogenic (ie. less likely to clog pores.) Fractionated coconut oil also has a higher concentration of Capric and Caprylic acids which make it a better antioxidant, anti-inflammatory and disinfectant than virgin coconut oil. Using a digital scale, begin by weighing out the emulsifying wax and stearic acid. Heat the ingredients in a glass Pyrex measuring cup at 50% power in the microwave or in a double boiler until melted. Now weigh out the mango butter and add to the melted emulsifying wax and stearic acid. Heat again until the mango butter has melted. Remove from heat. Next, weigh out the lanolin and stir into the melted ingredients until the lanolin melts completely. Weigh out the fractionated coconut oil and the safflower oil. Stir into the melted scrub base. 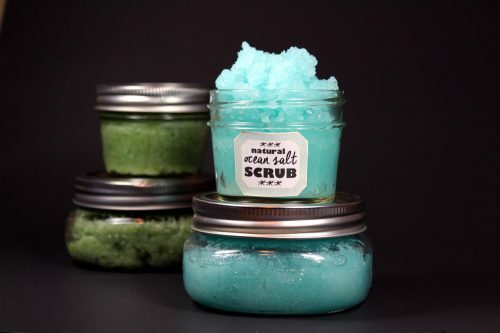 If using a fragrance in your sea salt face and body scrub recipe, you would weigh out and stir the fragrance in at this point. Now weigh out the dead sea salt into a separate 4 cup glass Pyrex measuring cup or glass bowl. Measure out the citric acid and whisk into the dead sea salt with a fork. (Citric acid is used in skin care products to brighten skin, shrink pores, treat mild acne, and correct dark spots and fine lines as well as to slough off dead skin cells and speed new cell turnover.) You can use more or less citric acid dependent upon your skin care needs, or omit it entirely. If using a colorant, you would add the color at this point and whisk into the salt as well. Now pour the melted wet face and body scrub ingredients into the dry dead sea salt mixture and whisk until thoroughly combined. 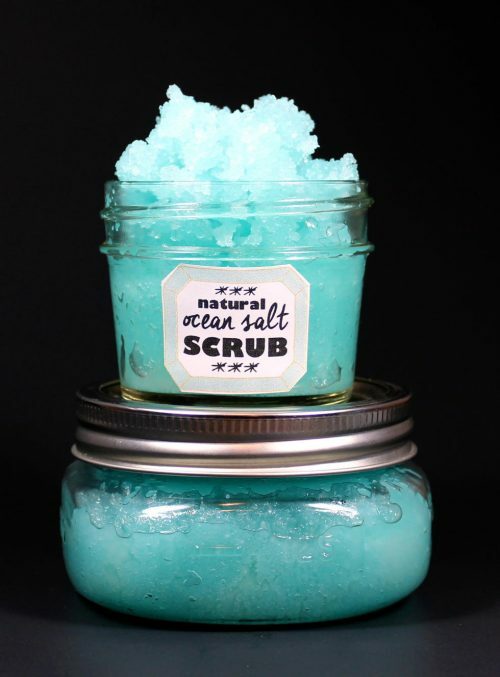 Mix the sea salt face and body scrub until it starts to thicken then spoon into clean containers. You can download the free printable labels for 4 oz. glass jelly or salve jars here. Simply print these labels onto full size label sheets, cut out and apply to your jars for homemade gifts or DIY wedding favors. (You can purchase bulk labels at great prices at WorldLabel here. Or go here for more DIY wedding favor ideas.) The border for these printable labels comes from a free clip art collection I acquired some time back from Citrus & Mint blog. Be sure to visit Citrus & Mint on Etsy for more amazing scrapbook and clip art elements that you can buy. Or check out the Citrus & Mint blog for free clip art elements and papers for personal use as well as tutorials on incorporating these scrapbook papers and clip art elements into your own personal projects. You can also visit my blog post for DIY soap wedding favors here for a step by step tutorial – with screen shots – on how to create your own custom labels using clip art elements. To use this sea salt face and body scrub simply scoop the desired amount onto hands and massage onto wet skin as desired. Rinse clean, then pat dry. It is recommend that once you start using this product, you use it until it’s finished. Otherwise, if you don’t plan to use the entire sea salt face and body scrub once opened, or if you are selling this product, it is highly recommended that you include a natural, paraben free preservative such as Optiphen Plus. If you like my sea salt face and body scrub recipe you may also like my detox sugar scrub recipe. 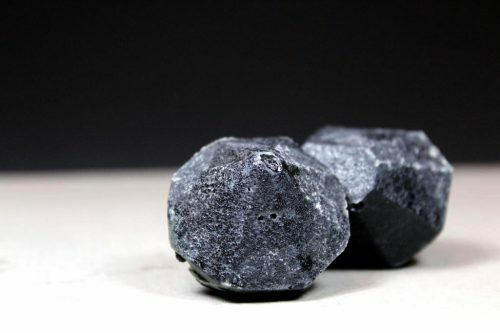 My detox sugar scrub recipe creates lovely solid sugar scrub shaped gemstones that contain activated charcoal to help keep skin acne free and vibrant! In addition to naturally detoxifying activated charcoal, this detox sugar scrub recipe also incorporates anti-acne/anti-aging sea buckthorn oil as well as lavender and tea tree essential oils. To discover even more natural skin care recipes as well as homemade soap recipes be sure to follow my boards on Pinterest. You can also find and follow me on Blog Lovin’, Tumblr, Facebook, Twitter, G+ and Instagram. I can’ wait to try this recipe. However how much preservative do you suggest on using? I would follow the manufacturer’s guidelines for the preservative you choose to use. I purchase all of my ingredients online as they typically cost less than hunting them down in a co-op. You’ll find links to suppliers within the recipe for your convenience. Hope this helps. Cual seria el tiempo de expiracion de estos productos ? It will the be the same as the ingredient with the shortest shelf life.